We are happy to share all new features that will significantly improve the ease in which teachers manage their classroom. 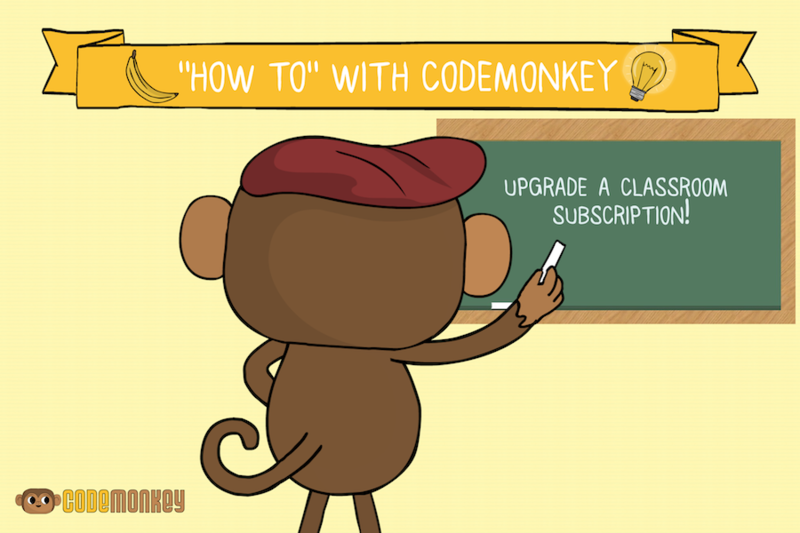 CodeMonkey now offers the ability to have more than one teacher subscription- and you have the ability to change between them whenever you need! Read on to find out more information. Teachers are now able to have more than one classroom subscription and are also able to assign different subscriptions for separate classes. This offers teachers more options when it comes to teaching code and helps them manage their subscriptions on their own. Click on the upwards arrow icon on the right side of the screen, underneath the Actions column. Under ‘Upgrade to:’, choose the subscription you would like to upgrade to. If you only have one other subscription to choose from, the box will automatically choose it for you. Please note: upgrading the classroom will not free seats in the classroom’s current subscription. You will get a summary of the final seats usage after upgrade. Click on Confirm Upgrade to proceed.